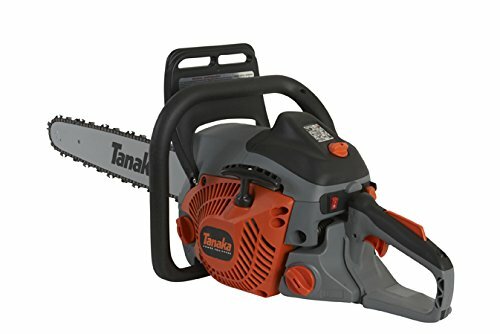 Tanaka have a range of chainsaws from professional grade saws to the saw for the average home owner, which can make it overwhelming for most people. 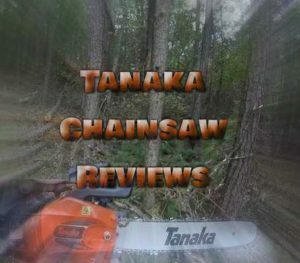 I hope my Tanaka chainsaw reviews will help you in finding the right chainsaw for you. What most homeowners look into is the fuel economy. Is the engine burning too much?. 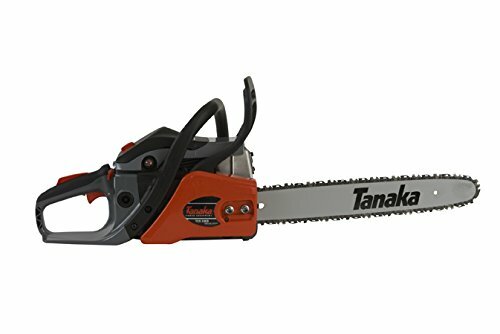 Tanaka chainsaws are designed to be fuel and oil efficient, with regulators that allow the control of the oil use. Still, making a right choice isn’t easy, especially with a comprehensive offer of great chainsaws on the market. If you’re looking for a chainsaw with the purpose of maintaining your land, Tanaka chainsaws are the ideal choice. They’ve built a reputation for being light and practical to use, with very little chokes and glitches. Here are my top picks for the best Tanaka chainsaws to consider for your land. 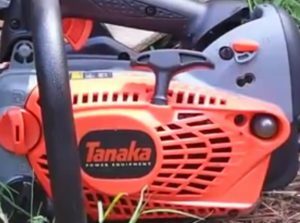 The Tanaka TCS33EB features a 16-inch bar and chain with a PureFire 32cc, 1.6hp two-stroke engine. The chainsaw comes is CARB compliant and has a side-access chain tensioner for more convenient use. The model is designed to be compact, easy-to-use and comfortable, which means it will make an excellent fit for an average user in need of a good chainsaw for landscaping needs. 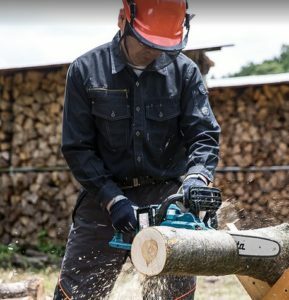 Light Weight: The Tanaka TCS33EB is very lightweight, which makes it convenient for prolonged use and more demanding work like cutting trees. The lightness makes it suitable for many private users who don’t possess the strength or the skill to maneuver a heavy-weight chainsaw, which is good news for an average homeowner looking for a simple, yet useful tool. Easy start: This chainsaw won’t be a hassle to start, and it won’t stop working half-way through cutting. Great performance: This tool performs well when used according to the guidelines, without glitches or breaks. Strong Power: The Tanaka model works with a substantial amount of power, which makes the cutting fast, simple, and effective. Screws on chain tightening. There’s not much good to say about the design of tightening screws, but it doesn’t interfere with the performance. Requires frequent breaks. You won’t be able to use this chainsaw for a long time without taking a break, which is something to think about if you’re looking for a tool to support high-volume cutting. This is less of an issue if you follow the guide lines properly. Too much plastic. While the plastic reduces the weight of the chainsaw, it might come of low-quality looking to some. Again, this is a feature that serves a purpose. If you’re looking for a robust, heavy-looking model, you should probably try out a different chainsaw. The Tanaka TCS33EB is an excellent deal within its price range. The slight issues with tightening screws and the matter of personal preference when it comes to design can’t overshadow its high performance. The first thing I need to say about this chainsaw is that it is a top handle chainsaw. What that means is that throttle is on the top of it, instead of at the rear. This is designed for arborists in particular, since it gives you increased maneuverability when you’re cramped up in a tree. That is what they are designed for, but this comes at the cost of them being not very good at cutting from the ground. So I would highly recommend one of the other models on this list, if you’re planing on cutting from the ground. Tho this is one of the best arborist chainsaws for those on a budget. The Tanaka TCS33EDTP features a 14-inch bar and chain, and it is designed to save on fuel consumption while providing a clean performance. The model features a half throttle choke to make a start easier and for the tool to warm up faster. This is useful if you have to start it up in a tree. It has side access tensioning for convenient and accessible chain adjustment. The natural use is further guaranteed with the gear-driven, automatic oiler. Easy Start: This model is comfortable and convenient to start, with all of the features working as described. You won’t have to waste time getting it to start while you’re rushing to finish the work, and it also won’t choke when you need it to run the most. Fast and effective performance: The chainsaw runs and cuts fast, and it’s relatively easy to handle. It does take breaks, but not so much as to become a major time consumer. If you need the chainsaw for housework, climbing purposes, or to cut the extra branches from the trees in your front yard, this one guarantees easy work. Economic: This Tanaka model saves power and runs for a long time thanks to the automatic oiler. Tension adjustment. As with many Tanaka models, the tension adjustment isn’t significant. Luckily, it won’t cause significant issues with performance. Leaks oil. On rare occasions, the chainsaw will leak oil. The problem, however, isn’t so frequent to consider it an issue. Slight performance problems. The chainsaw tends to stop working occasionally but runs with no problems after a while. Keep that in mind if you’re planning a prolonged use. Tanaka TCS33EDTP is a great, lightweight tool for a homeowner who is looking for a practical tool to maintain their trees. Like all models, it comes with small issues alongside good performance, such as oil leaks and tension adjustment issues. Tanaka TCS51EAP comes with a 20-inch bar chain and is designed for a strong performance thanks to its 50.1cc PureFire engine. This model promises a smooth start with a warm-up mechanism with an auto return choke, primer bulb, and the decompression valve. The adjustable automatic oiler allows you to control the flow of the oil to the bar and chain which is a useful feature. Sleek start: This Tanaka model starts easy, as the manufacturer guarantees. You won’t have to spend much time trying to get it to run. Great quality: The tool operates with plenty of power, building a reputation for good performance. Start issues in cold temperatures. If you try to use this chainsaw in the lower temperatures, there’s a possibility it will have trouble starting. However, it will run smoothly after it gets warmed up. Problems with tension adjustment. As many Tanaka models, this one too shows the lack of a proper mechanism for tension adjustment. It shouldn’t be a big issue, but it does raise safety concerns if you’re planning to use it for heavy, more extended sessions. 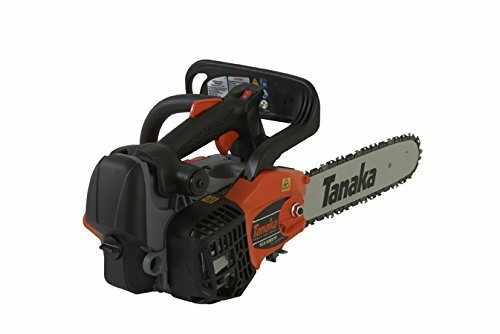 This Tanaka model is a good fit for those looking for a dull, useful chainsaw that is fuel efficient. It won’t run correctly in cold weather, but it is a minor drawback compared to its usual performance. Whenever I review a brand I like to know more about the company, which is something that I consider to be an important step. You can learn a lot from a companies history which reflects I believe you can see in there products. If a company has been the top of any field then you know, that they hold quality at a higher level then most. Or if the company still remains in the family, so they have there family name on on the line. Both small things but can mean a lot in the long run. The thing that surprised me the most was just how long the Tanaka company has been around, being founded in 1941 by Takashi Tanaka near Tokyo, Japan. They originally began developing compact internal combustion engines, and became the leading manufacturers in the aero plane industry. It was eventually taken over by Takashi son in 1965, and proceeded to passed through for four generations. It wasn’t until 1978 that they started to import to the USA, and established an office here. Eventually there assets were purchased, and started full time production in the USA. They were owned by Arien for a while who are known for being the mower of the white house, which is pretty impressive. Eventually this partnership ended and Tanaka was purchased by Hitachi who are a fairly well renowned brand. This partnership still exists to this day with the goal of becoming market leaders in outdoor power equipment. Chainsaws are becoming more and more advance as each year passes on, which can make it very difficult to know just what to look for. Would you believe the best and first step you should take is your backyard? Or where ever you will be cutting. 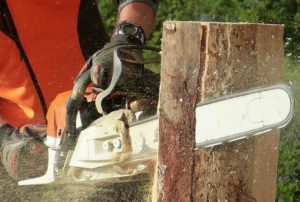 Knowing what you need to cut will be the biggest help in choosing the right chainsaw for you. For example if you only need to do a light bit of trimming and delimbing of some small tree limbs, that are close to a power socket. The a smaller 8 amp electric chainsaw could do the trick. So the first step is choosing between an electric, cordless electric, and gas chainsaws. All three have there pros and cons and all excel at certain things. While personally I like gas chainsaws, they are often more powerful and are customizable. Small gas chainsaws are also very helpful in tight locations where trees need attention. However they can be more difficult to start compared to an electric while also being more noisy and require the most maintenance. While this isn’t a problem for me, I know it can be overwhelming to new people. Cordless electric and electric are very similar in a lot of ways. With the obvious being the battery and cord being the difference. The cordless solves the limited range of a normal electric, and the corded electric solves the running out of power of a cordless. So they are very similar in that regard. But I feel a cordless electric is more versatile, especially if you have several batteries for them. Bar size can be a difficult thing to work out from the start. How much difference is there between a 16 inch and a 14 inch bar? The answer is not a whole lot to be honest. Sometimes technique is a lot more important, and what is powering said bar and chain. Tho there are obviously some things that are no way comparable. A 16 inch bar won’t be anywhere near as effective at removing larger trees as a 24 inch bar. Again it comes back down to what you need to cut, will help determine what size bar you will need. While protective gear isn’t something you immediately think of, it is extremely important. There are a lot of stories out there of chainsaws slipping or kicking back and getting a horrific injury, or worse. There are several pieces of equipment that will make operating a chainsaw safe, and you should wear them all. You will see a lot of “experienced” users showing off there chainsaws without wearing there protective gear, which sends a dangerous message. You won’t see a professional not wearing the safety gear. The protective gear you should be wear are cut resistant clothes, pants and shirt. Apart from those you should be wearing enclosed work boots like steel caps, gloves that are slip resistant, a helmet with out without a face mask. If you don’t have one with a face mask, then you should wear some form of eye protection, and ear muffs, and some kind of mask for your mouth. This is a lot to wear but chainsaws are dangerous and you can forget that when you use them for so long. Often most mistakes happen when people get complacent, then they just vague out for a second the chainsaw kicks back then injury. It appears that these Tanaka models all have a couple of features in common. They are light, compact, and fuel-efficient. They are also active in performance, but the matter of tension adjustment remains a problem. Whether or not it will be a problem for you depends on your skill level and the type of work you plan on doing. These chainsaws are all designed for those who need a tool for regular landscape maintenance, which means they don’t require any professional knowledge or skill. If you would like to know more about Tanaka the brand, company and their chainsaws, read my guide to who makes Tanaka chainsaws here.